The very first British Airways Run Gatwick takes place on Sunday 13th May 2018 and thousands of runners are gearing up for what promises to be one of the most exciting running events in the south east. Our Event Preview provides an insight into the days activities. With an International Half Marathon, 5K, Corporate 5K and Family Run all taking place on the same day, British Airways Run Gatwick has something for runners of all ages and abilities, making it a great day out for families, friends and colleagues this spring. The event will take runners on traffic-free routes through the parks, towns and beautiful West Sussex countryside around Gatwick Airport. Lining up at the start in just over a week will be elite, club and amateur runners from the UK and abroad, and the race organisers have confirmed that last places are available for anyone still wishing to be a part of this thrilling event. 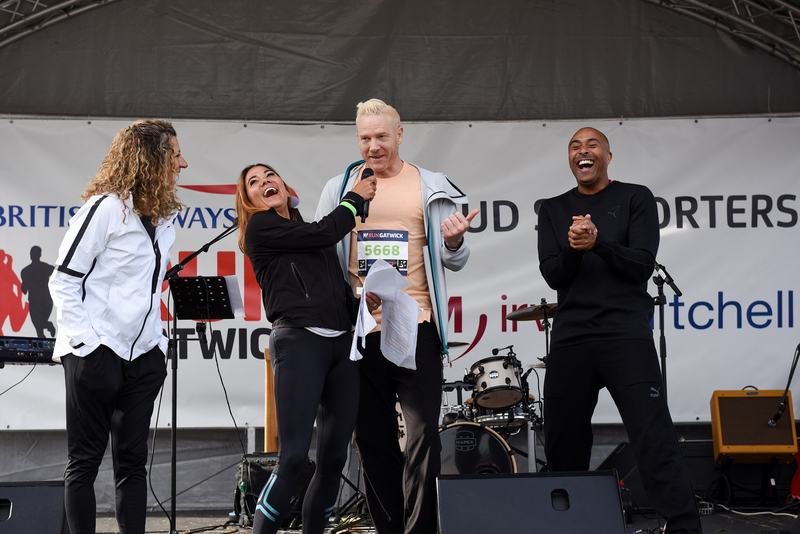 Of particular excitement is the recent announcement that top former British athletes Colin Jackson CBE, Sally Gunnell OBE and Iwan Thomas MBE will be attending British Airways Run Gatwick. Welsh former sprinting and hurdling athlete Colin Jackson will be the official starter for the International Half Marathon. Meanwhile, former track and field athlete and Olympic gold medallist Sally Gunnell will be taking part in the pre-race warm-up and starting the Family Run. Sally will be joined in the warm-up by Iwan Thomas, the Welsh former European and Commonwealth 400m champion, and Iwan will then go on to start the Corporate 5K before jumping in to run himself. All three former athletes are also ambassadors for Flying Start, the global charity partnership between British Airways and Comic Relief. The presence of these big names in running will be of huge motivation to all those taking part in British Airways Run Gatwick next week. Runners can also look forward to inspiring race commentary from popular endurance runner Susie Chan, who will be joined by fellow runner Tim Morgan. British Airways is the Headline Sponsor for Run Gatwick and runners will be treated to a first-class race experience, with an impressive flight-themed medal, professional organisation and a fully-equipped race village at Crawley’s Southgate Park. Runners and spectators should look out for the British Airways BASE CAMP and fan zones, where lots of fun activities and games will be taking place for everyone to get involved and take part in on race day. The race village will also offer a huge bag drop, a festival stage with live music and commentary, a pre-race warm-up with Sally and Iwan and plenty of delicious food and drink options. Those taking part in the half marathon will have a team of Xempo pacers to help them hit their target times. Pacers will be covering sub 1:30, sub 1:40, sub 1:50, sub 2:00, sub 2:10 and sub 2:20 finish times. All races will start and finish at Southgate Park. Additional information on race day road closures, car parking and public transport can be found on the race website at www.rungatwick.com/how-to-get-to-run-gatwick. Other partners for the event include Crawley Borough Council, Gatwick Airport, Intersport, On Running, Ambra, Jellyfish, Spire Gatwick Park, Vines BMW, Irwin Mitchell LLP, Metrobus, Manor Royal, Gatwick Diamond, Arora Hotel Gatwick and Charlwood. The 2018 British Airways Run Gatwick takes place on Sunday 13th May and entries are still open to all races. Entry costs £36 for the International Half Marathon and £25 for the 5K or Corporate 5K. The Ambra Corporate VIP Area is available for an additional £12 per person. Entry to the Family Run costs £12 for children aged 4-15 years, and £1 for accompanying adults. Entries will also be accepted on the day for all races, unless sell-out capacity is reached. Payment must be made in cash at the rate of £30 for the 5K and £40 for the half marathon.